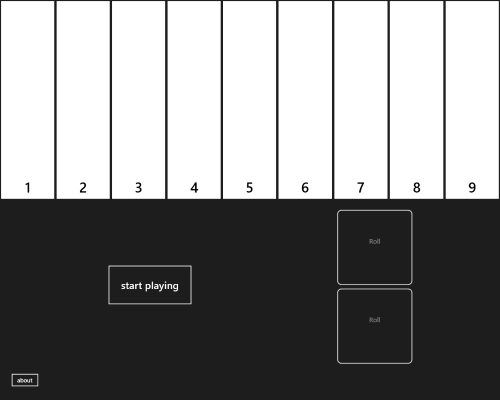 Shut the Box is my first attempt at a Windows Application. It runs on both Windows 8.1/10 and Windows Phone 8.1/10. The game is free in both app stores, and has no adverts. I have no plans to monetise the application, with the exception of the Donate links in the about page. You can view a list of versions and changes made here. The rules of the game are quite simple, roll the dice and shut any number of flaps that add up to the total on the dice, shut all the flaps, Win, run out of move, Lose. You can read more about the game on Wikipedia. I have only implemented the most basic game type, but I have a lot of ideas on my backlog to support other game types. There are already a few versions of this in the store, so why make another? Well, the ones in the Store(s) are OK, but they are quite limited in what the offer in terms of game play. I also have a soft spot for this game and I wanted to make a version of the game that I could customise. There’s also the typical developer answer of “because I can”. I’ve learnt a lot about XAML and Windows App development as this is quite a different application from what I usually work on, so it was also a good challenge. This started life before the UWP launched, so is a Windows 8 Universal App with a Shared Project (UWP is planned later). Most of the code is shared between both projects. I have no design skills what so ever, so the “metro” feel comes from all the UI been pure XAML, no images were used except for store/app icons - those were hard enough. I kind of like the simplicity. It has Internet access only for Application Insights at the moment, I have no plans to change this for any new features.